Thai anti-graft body has indicted ousted PM Yingluck Shinawatra over a controversial rice subsidy scheme. The case will now be voted on at the Senate. 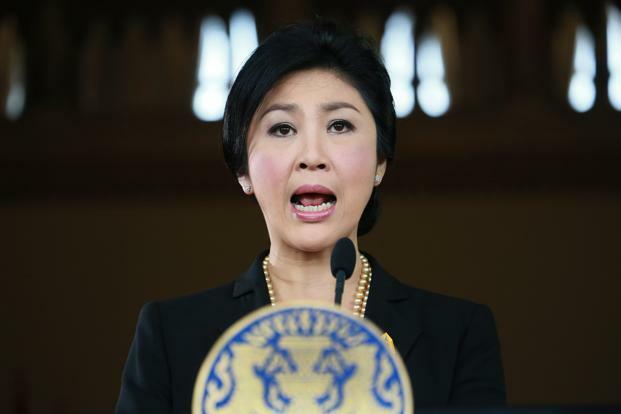 If impeached, Yingluck Shinawatra will be barred from politics for five years. On Wednesday, a Thai court ordered Yingluck Shinawatra and several cabinet ministers to step down over separate charges. Thailand has been in political turmoil since anti-government protests erupted in November 2013. In February, snap elections were annulled. The National Anti-Corruption Commission (NACC) unanimously voted to indict Yingluck Shinawatra, the commission’s chief said on Thursday. “The committee has investigated and there is enough evidence to make a case … We will now forward it to the Senate,” Panthep Klanarong said. The NACC is also considering whether to file criminal charges against Yingluck Shinawatra. Yingluck Shinawatra has previously said she was only in charge of formulating the policy, not the day-to-day running of the scheme, and has said that the commission treated her unfairly. Under the rice subsidy scheme, the government bought rice from Thai farmers at a much higher price than on the global market. However, it resulted in the accumulation of huge stockpiles of rice and hit Thailand’s rice exports hard. Critics said the scheme was too expensive and vulnerable to corruption. Separately, on Wednesday, Thailand’s Constitutional Court ruled that Yingluck Shinawatra acted illegally when she transferred her national security head to another position in 2011. Yingluck Shinawatra stepped down, and Commerce Minister Niwatthamrong Boonsongphaisan replaced her as prime minister. Her supporters believe the courts are biased against her. Yingluck Shinawatra leads the ruling Pheu Thai Party, which won elections in 2011. It commands strong support from rural voters, especially in Thailand’s north and north-east. However, anti-government protesters, who tend to be urban and middle-class voters, have protested against Yingluck Shinawatra’s administration for months, occupying official buildings and disrupting elections in February. They say ousted former leader Thaksin Shinawatra, who is also Yingluck Shinawatra’s brother, is still controlling the government, and that the ruling party has been buying votes with irresponsible spending pledges aimed at its support base. Both sides have planned rallies this week, and there are fears that clashes could occur. Thailand’s government has scheduled elections for July 20 after the February vote was declared unconstitutional. However, the opposition says it will not contest the polls and that political reforms need to be introduced first.